62 year-old Ernesto Caliz Sr., former supervisor at The San Pedro Town Council (SPTC), was charged with sexual assault on a 3-year-old child. However, he is out of jail after he was offered a bail of $5,000. Caliz had been remanded to the Belize Central Prison until his next adjournment on January 6, 2017, but his attorney managed to have Justice Adolph Lucas approve his bail application on Friday, December 9th. 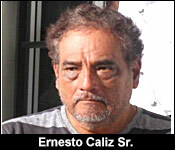 The incident was reported to San Pedro Police early in December, when Caliz was accused of fondling a 3-year-old girl. He was arraigned on Tuesday, December 6th in San Pedro Town, after the Magistrate denied him bail. However, three days after, he was a free man after being granted a Supreme Court bail. The bail was given with the condition that Caliz is to appear before the Magistrate at San Pedro’s Magistrate Court on January 6, 2017 and any other date he is ordered to appear in court by the Magistrate. Another condition requires him to report to the San Pedro Police Station every Friday, starting Friday, December 16th until the case is closed. Caliz has been ordered not to interfere with any of the prosecution witnesses, especially with the complainant or any members of her family. He is not to go near where she lives. The Judge was very clear that if he breaches any of these conditions, his bail will be revoked and he will be immediately sent back to the Belize Central Prison. Caliz has since been dismissed from his job post at the SPTC. The San Pedro Sun will keep following this developing story.